In what was expected to be a lopsided affair against professional team Les Canadiennes, the Stingers women’s hockey team managed to offer a great effort in Sunday’s exhibition matchup. The intense forecheck and speed they offered against Waterloo in their preseason game the day before paid off once again against the Canadiennes. After getting trapped in their own end for the majority of the first period, Concordia capitalized on a quick turnover. Veteran forward Claudia Dubois scored off a strong pass from Marie-Pascale Bernier, completing the odd man rush. The Stingers did come out more confident in the second period. The squad got great chances off the rush and even managed to build a couple of solid offensive presences. The end of the second was detrimental to coach Chu’s squad as they gave up two quick goals to close the period. “Yeah, I think those 30 seconds really hurt us,” said Chu on the turning point of the game. Stingers alumni Marie-Joelle Allard recorded a point on each of those goals, scoring the first and assisting on the second. It was her first time playing against her former school. Allard was not the only alumnus on the ice. Tracy-Ann Lavigne is starting her second year with the Fabs. Work harder they did, as the Canadiennes completely dominated the first half of the third period. They managed to add to their lead quickly as rookie Geneviève Bannon tallied from the slot on a nice assist from Katia Clement-Heydra, bringing the score to 4-1 in favour of Montreal. The Fabs added three goals before the midway point of the third, leaving the Stingers in the dust. However, the Concordia side showed resilience after the shellshock of the first half of the third. Unfortunately, three games in three days seemed to take its toll on the Stingers. Clearly, there is one point to work on for the Stingers before the start of the season. “play and compete for a full 60 minutes” said coach Chu. “The moment we take a couple of seconds off, a great team, like Les Canadiennes, is gonna make us pay.” added Chu. The Stingers are closing out their exhibition games next weekend as they are taking on two NCAA teams. They face off against Providence on Friday night and Northeastern on Saturday afternoon. 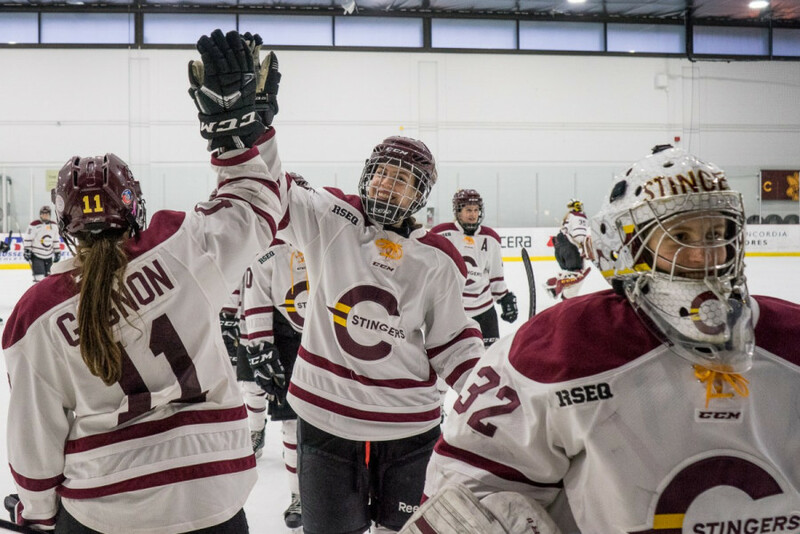 The Stingers women’s hockey team will open their season on Oct. 21, 2018 when they travel to play the Gee-Gees in Ottawa.